I'm not a Halloween girl. I didn't grow up partaking in the festivities (imagine. My mother leaving me to knock on random strangers' doors for sweets. Not where I come from.) and by the time I came here, I felt like I was stealing candy better left for the ghost children. Also, pumpkin spice. What? While I'm not going to be dressing up for Halloween. 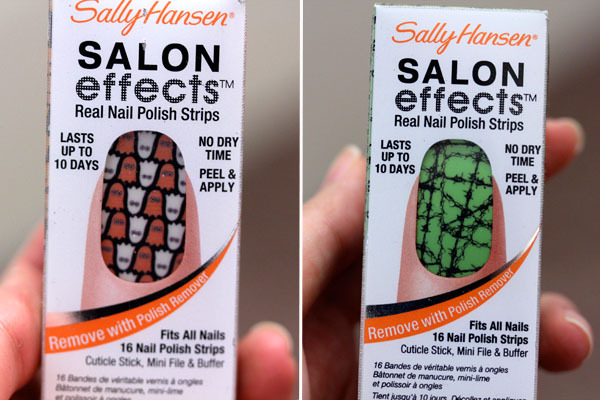 I think people need to know about these limited edition Sally Hansen Salon Effects Nail Polish Strips. Aren't they just the best idea ever? I'm saving them for closer to Halloween, but for now you can see how one of them looks on Karla's fingers. There are five strips you can choose from. Featured here are Ghoulie Girl and Hot Wired, the three others are Wish Nets (red with black fish net pattern), Numbskull (skull and crossbones pattern), and Spun for you (cobwebs of course). I purchased mine for $9.99 from ulta.com.